Unleash the creative genius in you by making your own music. Writing a song is so easy anyone can do it. Drag some notes, add some rests, sprinkle a few lyrics and you have your music. Share with friends, follow others and see their masterpieces. The simple interface is ideal for all ages: kids, teens and adults. Keep the kids occupied on a long trip, write down the song that pops in your head, share your work with friends. - Ability to drag and drop musical symbols and delete with ease. - Listen to your music. - Save your music for future modifications and sharing with your friends. - View, open and listen to fellow musicians' masterpieces. - Follow your favorites, post comments and like songs. 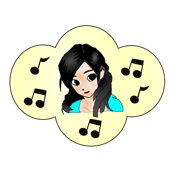 - Get notified when friends create new songs, comment or like your music.